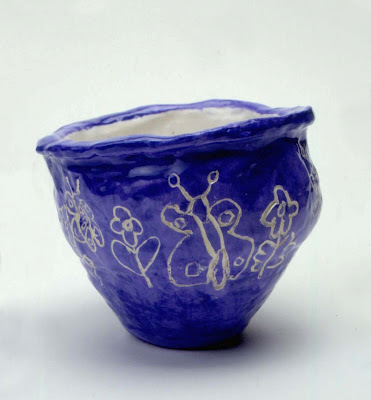 The children learn how to control the shapes of coil pots and then decorate them using the sgraffito technique of carving designs into colored underglazes to reveal the clay beneath. For ages 9 to 13. Plan 5 to 6 sessions. 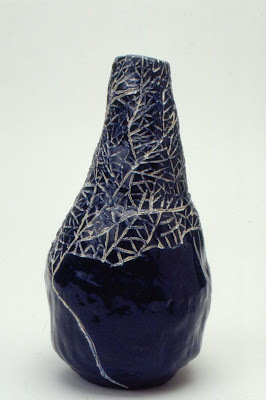 Click here for more information on working with clay. A variety of shapes for clay pots can be found in ancient Greek pottery. Click here and scroll down to see five interesting examples. Wedge the clay into grapefruit-sized balls. Set out one for each child plus a few extra. Cover work area with individual masonite boards or canvas. Have pictures or examples of pottery shapes available for discussion. Explain to the children that they will be building clay pots with shapes that have sides which move in and out. The pots will be between eight and twelve inches tall, therefore only the bottom halves will be made in this session. This will allow the clay to harden slightly so it can support the weight of the rest of the pot which will be made in the next session. Demonstrate how to make a coil. Roll a lump of clay between your hands to form a thick snake-like shape. Put the “snake” on a flat surface. Starting with your fingertips, roll the clay down to the bottom of the palm of your hand and back to your fingertips. Repeat this motion moving up and down the coil, gradually increasing pressure until the coil is about a half-inch in diameter. If the thickness of the coil is uneven, place your hand over the thicker spots and roll with a little pressure. The rest of the coil will not be affected. To make a base, flatten a piece of clay to a half-inch thickness, slightly larger than the planned bottom of the pot. The first coil will need to be scratched and slipped to the base. With a needle tool, scratch the clay on the top of the base about a half-inch inside of the edge. (Explain to the children that this half-inch of clay will prevent the pot from sagging while the clay is soft, and will be trimmed away after the clay begins to harden.) Attach the first coil along the scratched area of the base with a small amount of slip or water. Join the rest of the coils by supporting the outside of the pot with one hand and, on the inside of the pot, gently pushing a small amount of clay from the top coil into the coil below it. As each coil runs out, attach the next one directly against the end of the previous coil. 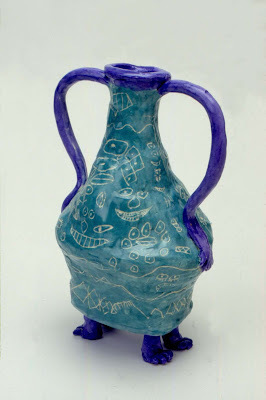 Show the children some examples of pottery shapes and demonstrate how these shapes can be achieved. A coil placed directly on top of the coil below it will make a straight-sided pot. If the coil is placed on the outside edge of the coil below it, the pot will gradually flare open. If the coil is placed on the inside edge of the coil below it, the pot will begin to close. Explain that for this project, the sides of the pots should move in and out at least once. Have the children make the base and first half of their pots, smoothing and joining the coils on the inside of the pots as they work. Note: Allow the pots to harden slightly and then store them on trays, tightly covered with plastic. Keep the demonstration pot to use throughout the sessions. Set out one ball of clay for each child, plus a few extra. Set out clay pots, needle tools, and containers of slip or water. In this session the shapes of the pots will be completed. In the next session the coils on the outside of the pots will be smoothed and additions such as handles or feet can be added. Remind the children that their pots should be eight to twelve inches tall and that the sides should move in and out at least once. The first coil to be attached to a slightly hardened pot needs to be scratched and slipped to the rim of the pot. The rest of the coils can be joined on the inside as in the first session. Explain that the top of a pot is called the lip, and it needs to be planned carefully to give the pot a finished look. Have the children complete the shapes and lips of the pots. Note: To keep the clay workable for the next session, place slightly dampened paper towels over the tops of the pots and cover with plastic. Explain to the children that they will be trimming the extra clay from the base of their pots, smoothing the coils on the outside surface, and making optional additions such as handles or feet. Demonstrate how to trim the extra half-inch of clay from the base of the pot. With the needle tool slanted slightly inward, carefully cut the extra clay from around the base and smooth the rough edges. Have the children join the coils on the surface of the pots by rubbing them into the coils above and below. Small pieces of clay can be added to smooth rough areas. After the coils are joined, the children can add handles, feet, or other additions, remembering to scratch and slip all pieces to be attached. Note: Cover the pots with plastic to keep them leather-hard for the next session. Set out leather-hard pots, colored underglazes, and brushes. Set out pencils and sketch paper. 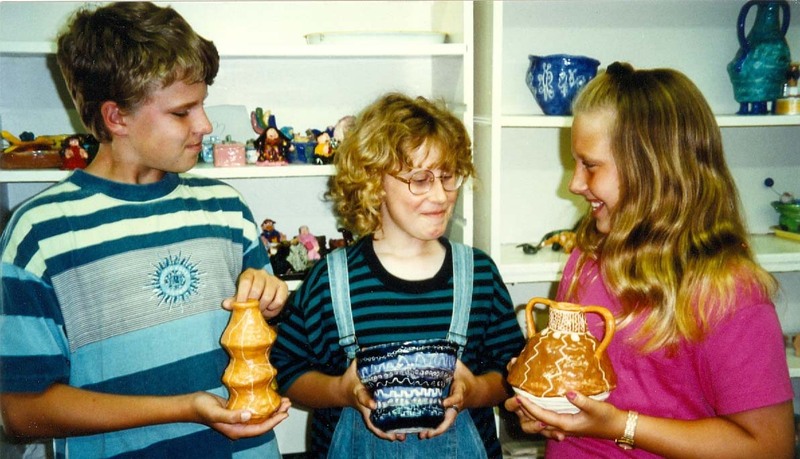 Explain that in this session the children will be applying underglaze (paint for clay) to their pots and in the next session they will be decorating them using the sgraffito technique of carving designs into the underglaze. After firing in the kiln, the areas that have been carved away will become the color of the clay, contrasting with the color of the underglaze. Be sure the children understand that the pots are now leather-hard or hard enough that the shapes cannot be changed. The pots are fragile and should be lifted by the bulk of their body, not by their handles or any of the additions. Demonstrate how to apply the underglazes. Since the leather-hard clay still has moisture in it, the underglazes will take longer to dry then when putting them on bisque-fired clay. Brush on the underglaze, allow it to dry to the touch, and then apply a second coat. If time permits, apply a third coat. While waiting for the underglaze to dry between coats, the children can use pencil and paper to plan sgraffito designs that will work with the shapes of their pots. Note: After the underglaze dries to the touch, cover the pots tightly to keep them leather-hard. Set out the underglazed pots. Set out scratch-art tools, needle tools, and the children’s sketches from the previous session. Explain that in this session the children will be decorating their pots using the sgraffito technique. Use the demonstration pot to show the children how to scratch lightly into the underglaze without gouging the clay. The lines can be thin to thick and whole areas can be removed using the sides of the instruments. The bits of clay that form can be gently brushed off. Have the children complete the sgraffito designs on their pots. Note: Slowly dry the pots and then bisque fire them in a kiln. Set out the bisque-fired pots. Set out containers of clear glaze and brushes. Explain to the children that the pots have been fired for the first time in the kiln and are now referred to as bisque. A clear glaze is applied to the bisque to give it a strong surface. The glaze will cover up the underglaze colors temporarily. When the clay is fired in the kiln again, the glaze will melt and turn clear, allowing the colors to show through. Make sure the children understand that if any glaze gets on the bottom of the bisque, it will stick to the kiln shelf during firing. If glaze does get on the bottom, wipe it off with a damp cloth. Have the children brush away any chips of underglaze which might have fallen into the scratched lines and then apply the clear glaze to the pots. Note: When the pots are completely dry, glaze fire them. This project is best for children who have had some experience making and working with clay coils. The coils need to be at least a half-inch thick so the pots will be strong enough to be smoothed and decorated using the sgraffito techique. Keep the clay workable between sessions by covering it tightly with plastic. If the pots become too dry, place slightly dampened paper towels over them before covering them with the plastic. It’s important to emphasize and monitor the safe use of the needle tools and the scratch-art tools. 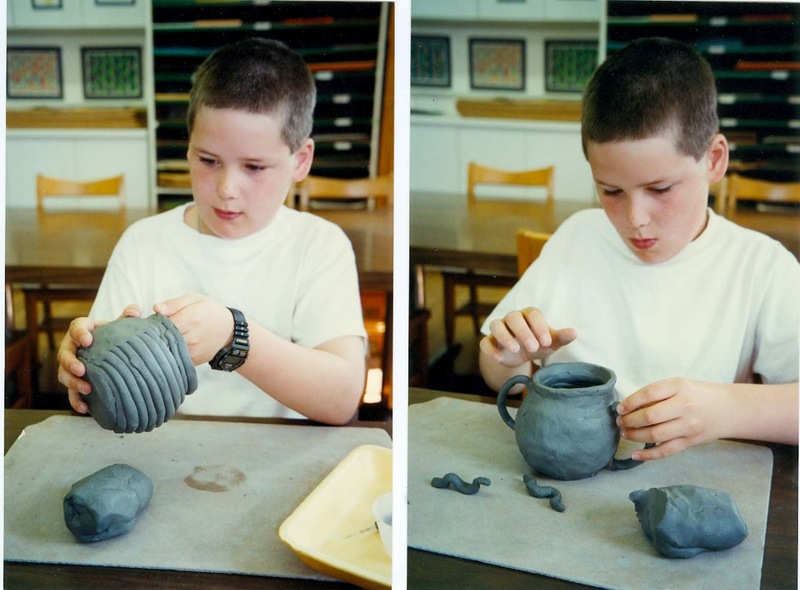 Compare the various shapes of the pots and discuss how they were achieved. Point out how the lips make the pots look more finished. My pot keeps getting fatter! Do I have to smooth the coils on my pot? I like my pot the way it is. Do I have to put handles or feet on it? I made a mistake and scratched out a line in the wrong place. Remember that if you lay a coil on the outside edge of the coil below it, the side of the pot will flare out. Putting the coil on the inside edge of the coil below it will make the pot narrower. Although you can leave some coils showing, you will need to smooth enough of the surface to put on the sgraffito design. 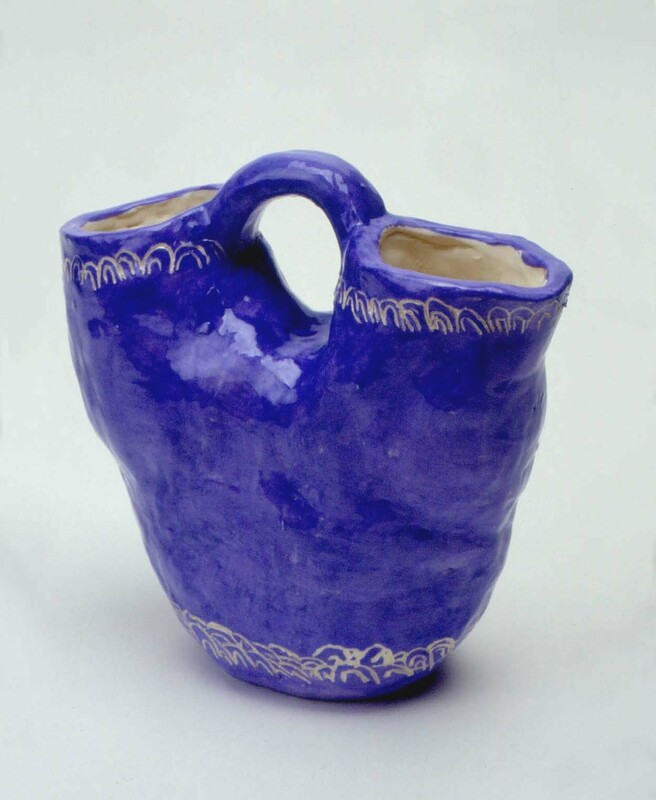 You can decide whether to add handles or feet, however be sure to plan a lip so the pot will have a finished look. 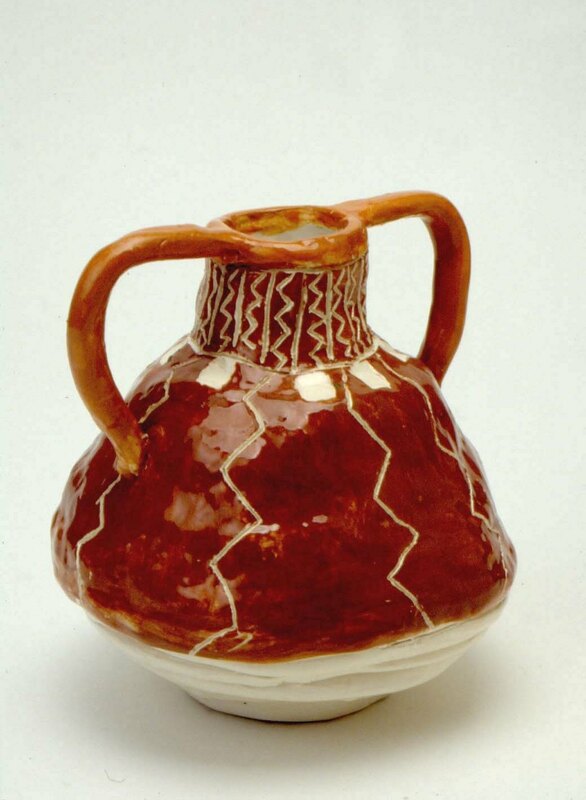 Because the line is carved into the pot, try to make it part of your design. However, you can fill in the line with a bit of underglaze.